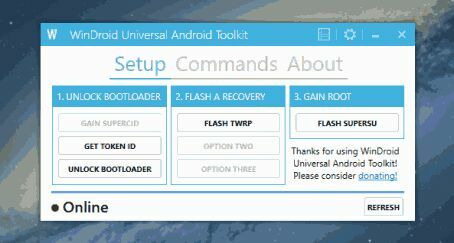 Windroid Universal Android Toolkit is an application GUI program built in that takesADB and Fastboot commands and incoporates them into an easy to use toolkit that are supportrd by most Android devices. the aim of this progran is to make the process of unlocking a device bootloader and also flashing of custom recoveries as well as gaining root access, easy. I wont be held responsible for any harm, damage, nuclear fission or bee infestation that may occur to your device through the use of this toolkit.